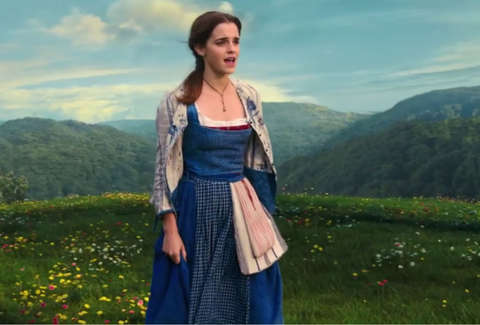 Wait, Is That Actually Emma Watson Singing in 'Beauty and the Beast'? "I can answer that she does -- she sings throughout this film," Stevens says in the above interview. "She sings a lot, fantastically." In fact, you'll find Watson listed on five of the soundtrack's songs, including "Belle," "Days in the Sun," and "Something There." The doubt dates back to 2015, when the Harry Potter actress first addressed the starring role on social media, writing that it was "time to start some singing lessons." Facebook comment sections lit up. Beauty and the Beast was a precious property, and while Watson looked the part, sounding the part was key. "I've never had to [sing] for a film role before, and I think people will be interested to see me do something very different," Watson told Total Film magazine. "It gives me a different challenge, really." "I had three hours in a recording studio," she told Daily Mail of her audition process. "It was really raw, but [director Bill Condon] was pleased. And Disney was pleased." "I always had loved singing, but I took this kind of massive hiatus," she told Hollywood XYZ. "I used to sing as a child and then I made seven Harry Potter films and went to university and whatever else, so [singing for Beauty and the Beast] was sort of like dusting the cobwebs off my singing voice." "We prerecorded [all the songs]," Luke Evans told Collider. "But some of us sang live on set as well, during the takes. We were mic'd and they recorded that, and I think afterward, in sound, they’ll be able to chose whether the live version is better than the pre-recorded version. So we'll never know!" "To [sing] for the first time in a musical as big and beloved as this one, I definitely felt the pressure," she told Metro Entertainment. "Also it was such a dream come true because I absolutely loved those songs as a child, and I already knew all the lyrics before I took on the role. My love for the music carried me through it." "At the beginning of the movie, I was nervous to sing in front of three people," she told MTV News. "By the end, I was singing live in front of 300." "I was in tears. I couldn't believe that I -- after I managed to get through three months of singing lessons -- to see where I had got to," she told ITV's This Morning. "I couldn’t believe it, I was really proud." She also told the Daily Mail that she's going to continue taking voice lessons because "it actually really helps my acting, and my speaking voice," and "it's great for my breathing." But to really hear Watson's Belle in action, you'll have to hit play on the Spotify embed above or head to your local theater. If you're still unsure after that, there's always Céline Dion.